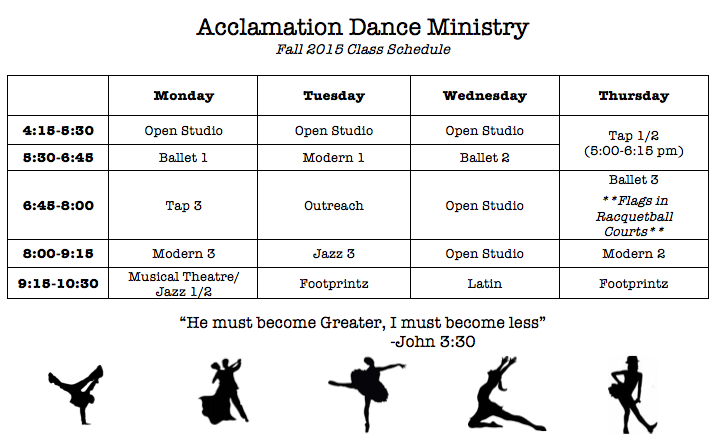 As we enter the third week of Acclamation classes, we ask that you decide which classes you would like to stick with this semester. Some schedules changes have been made, but the finalized schedule is shown below! Dues and shoe order forms are due Friday, September 25th. You can mail you shoe order forms, located in the Witmer dance studio, to Hannah Ruskan (unit. 6105). There is a box to collect the 5 dollar dues in the Witmer dance studio. Make sure to have them in by Friday! As always, if you have any questions, you can email Ashley Leggett at AL1311@messiah.edu! Previous postThe Beginning of a Good Year!